Groves Dictionary of Music and Musicians states that ‘Howard Blake has achieved fame as pianist, conductor and composer.’ He grew up in Brighton, at 18 winning a scholarship to The Royal Academy of Music where he studied piano and composition. 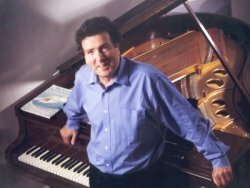 Over the course of an immensely busy musical career as composer, pianist and conductor he has created over 700 works in many genres and categories. His most famous score is undoubtedly that composed for the animated film 'The Snowman' with its iconic song 'Walking in the Air'. The orchestral concert version of 'The Snowman' is now performed world-wide whilst the stage show, in effect a full-length ballet choreographed by Robert North, has run for twenty years in the West End, courtesy of Sadlers Wells. Concert works include the Piano Concerto commissioned by The Philharmonia for Princess Diana's thirtieth birthday, the Violin Concerto commissioned by the City of Leeds and The English Northern Philharmonia, the Clarinet Concerto for Thea King and the English Chamber Orchestra and large-scale choral/orchestral works such as ‘The Passion of Mary’ and 'Benedictus',which was championed and recorded by Sir David Willcocks and Robert Tear with The Royal Philharmonic. His catalogue of CDs more recently added Sir Neville Marriner conducting his woodwind concertos with The Academy of St. Martin in the Fields and an album of his piano music recorded for Decca by Vladimir Ashkenazy. Amongst scores for feature films are 'A Month in the Country' which won him the BFI Anthony Asquith Award for musical excellence, Sir Ridley Scott's 'The Duellists' which won him the critics award at the Cannes Film Festival and his orchestral score for 'Flash Gordon' for which he was jointly nominated for a BAFTA award with the group Queen. In 2010 a performance of Howard's 'Diversions' in Bratislava by the young cellist Benedict Kloeckner won him The European Broadcasting Union Award, which led to further collaborations, more compositions and a complete album of music for cello and piano, with Howard playing the piano himself. It was called 'Diversions'. Howard is a Fellow of the Royal Academy of Music and received the Order of the British Empire from the Queen for services to music. Highbridge Music Ltd was incorporated in 1983 and is a music publishing company which exclusively publishes the works of English composer Howard Blake. It takes its name from Highbridge Mill near Cuckfield in Sussex, a converted watermill dating from 1810 which was the composer’s home from 1971 to 1981 and a source of inspiration for many of his musical works. He has written music for more than 50 years and during that time employed various publishers to administer his catalogue. On July 14th 2004 however he gathered in a large part of his catalogue and reorganised Highbridge Music to provide a hands-on service to those who wish to hire or buy his music. The new 2006 website was created from a comprehensive database of his entire varied output, which amounts to over 650 opus numbers. His works can be browsed by category, viewed as a chronological list or searched using the search box at the top of every page, whilst certain works are available as sheet music for download.